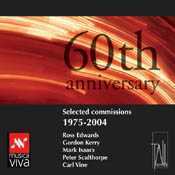 This new CD celebrates the achievements of Musica Viva Australia in fostering new Australian chamber music over the last 60 years. Since 1945, Music Viva has been involved in the creation of nearly 100 new works from a wide range of Australian composers in a programme that continues to develop an original body of Australian chamber music. The complete list of these works is included with the CD.